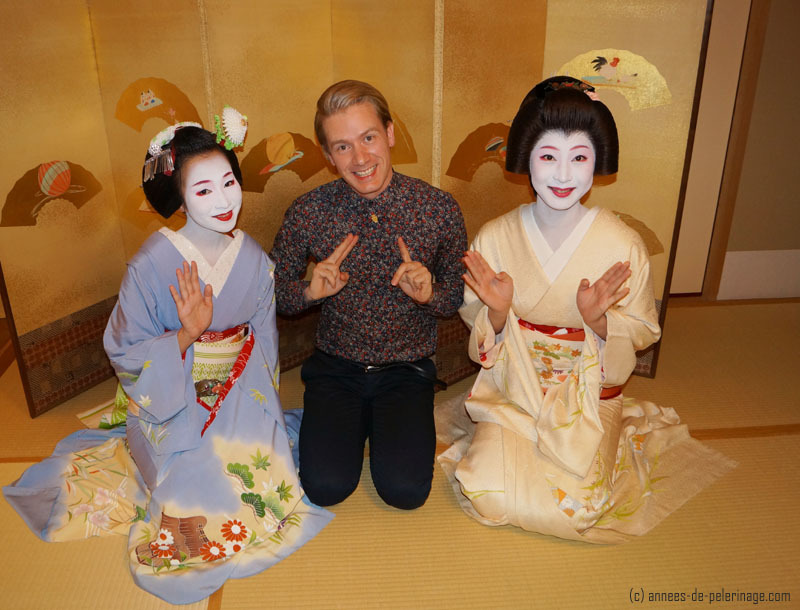 A short story about my personal experience at a geisha party in Kyoto. 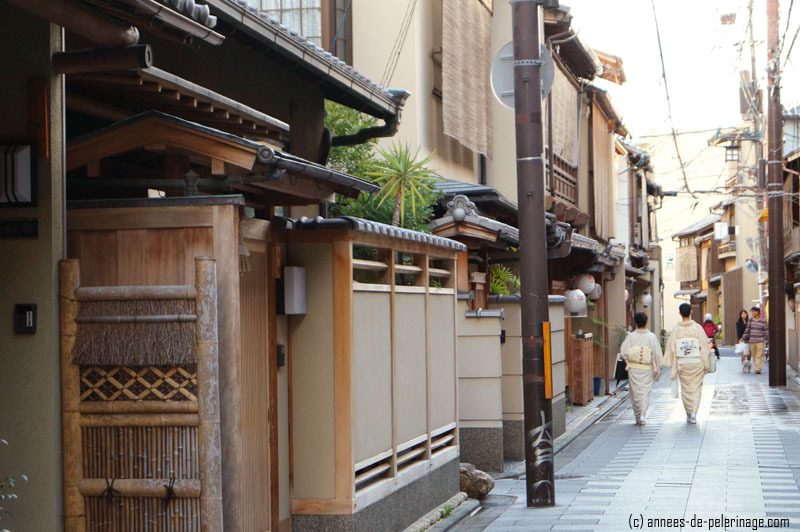 In the very heart of Kyoto, you will find a set of narrow streets lined with old timber houses. Among the locals, it is known as Gion or simply the kagai – the flower town. Passing by the non-descriptive facades a stranger might hear the distinct click of a sliding gate being closed or maybe the gargling of a hidden fountain. In a back lane, an elderly lady in a kimono will be ticktacking away on her geta, head all bowed while clutching a chrysanthemum sprinkled pouch. Few tourists will ever guess, let alone experience, which cultural treasures are hidden behind these closed doors. “Okiniiiii!”, that’s how the concierge concludes the phone call with what I assume must have been the geisha booking agency. Okini, not arigatou, the people in Kyoto stick to their traditions and to the peculiarities of their own dialect. I, too, feel like offering a sincere thank you, even though me and my dad are about to waste more than 1.000 Dollar on our evening with two geishas. Probably at the same time, somewhere in one of the said non-descriptive houses deep down in Gion, the practiced preparations for this evening will commence. They are called okiya. 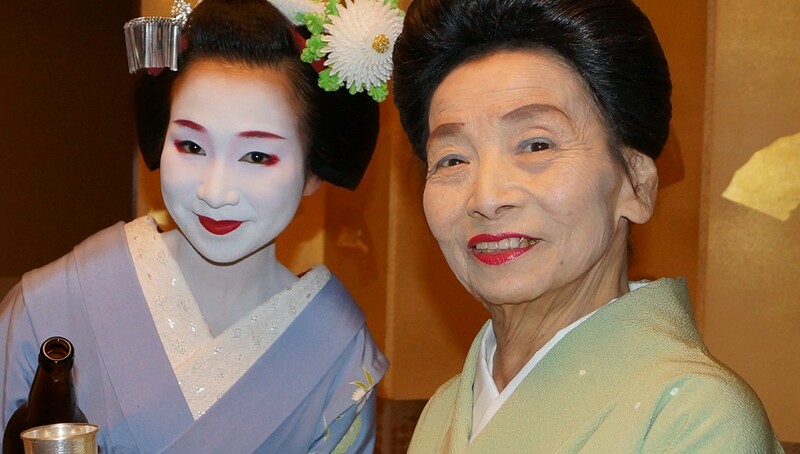 Here a full full-fledged geisha and her apprentice will start the time-consuming process of donning kimono, jewelry, and make-up worth more than some family homes. 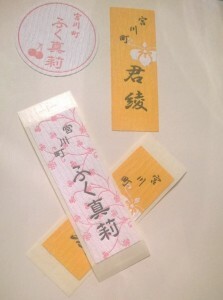 My butler informs me that my particular pick of the flowers of Gion will arrive at 6 pm. Plenty of time to decide what to wear tonight. Originally I wanted to bring my Lederhosen but the need for efficiency on a month long journey left no room for my traditional Bavarian dress. Now I somewhat regret it. From another perspective, I probably should not worry. 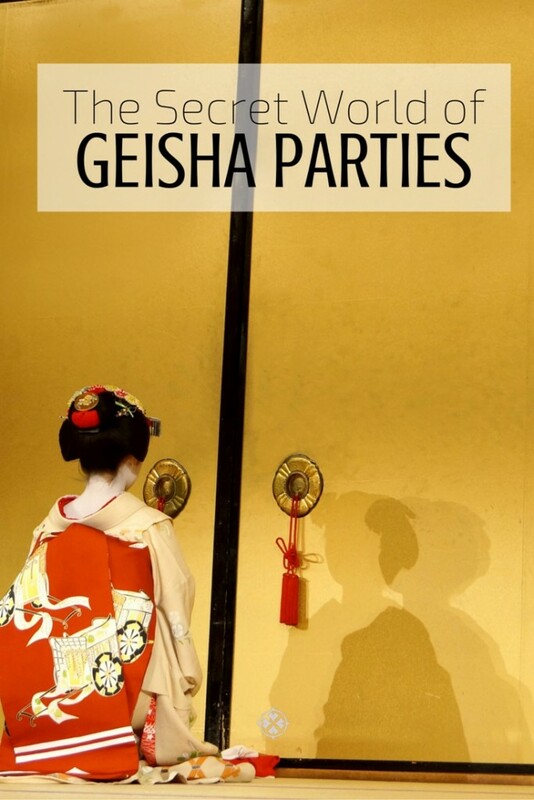 Geisha parties are never public and always happen behind closed doors. In our particular case, it will take place in the room of our Ryokan. The staff of the Tawaraya even gave us an upgrade (the Tawaraya is frequently ranked among the top 10 hotels in the world. Find my review here). More space, they said, was needed for the performance of the geisha. Don’t want to spent $1.000? Here is a guide on seeing Geishas for free! To foreigners the intricacies of the reclusive geisha world sound exceedingly peculiar. Eating alone in your hotel room is left to those scarce Sunday mornings, when you will chase down some romantic Hollywood nonsense together with your partner – or so common sense would dictate. But when booking a geisha for your evening entertainment, there is no way around staying inside. The tea-houses of Gion specialized on these secluded social events over the centuries. They even have their own name: ozashiki – the honorable tatami-matted room. A strange feeling knowing that those establishments do little more than renting out a few square meters of rice straw mats at a premium. You can certainly enjoy lavish dinners and exceptional parties there. But be aware that everything from the appetizer down to the dessert and the entertainment will be ordered elsewhere. What sounds almost outrageous to the western capitalist deep within: These tea-houses shameless exploit their exclusivity. Without an invitation and an existing customer vouching for your integrity, there is no way to get in. 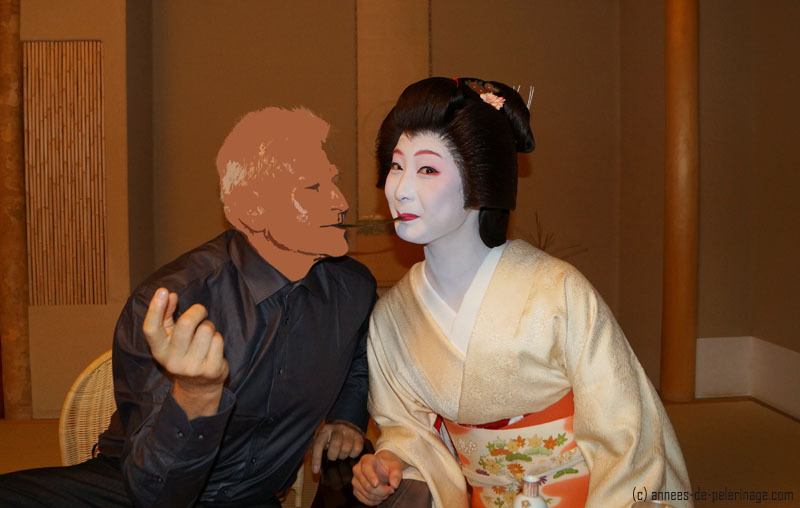 No way for you to join in the geisha-fun. I found a way around that problem. The ryokan where we are staying is over 300 years old and has close ties to the many okiyas of Gion. It is 6 o’ clock when my butler informs me that “geiko-san to maiko-san mairimashita”. They needed, however, a few more minutes to arrange their expensive kimonos after the ride in the cab. Oh, you can’t imagine the excitement that warred inside of me; warring, most of all, with the need to see the toilet again. However, any such urgent consideration is cut short by the gentle opening of the sliding doors to our room. What followed this tacit announcement is a rustling caravan loaded with the finest silks and gems. My eyes skip from tinkling hair-ornaments to lavish kimonos and ever on to the next detail – drinking in all the colorful exuberance that is presented to me with coy smiles and angelic voices. Our geishas have arrived! Alongside the geishas comes in an elderly lady with her shamisen in hand. This is, after all, supposed to be a party. A typical geisha entourage will consist of those three women: First of all someone to provide the music. Then of course a full-fledged geisha, called geiko in Japanese, that has run through years and years of harsh education in the finer arts of conversation, music, dance and play. 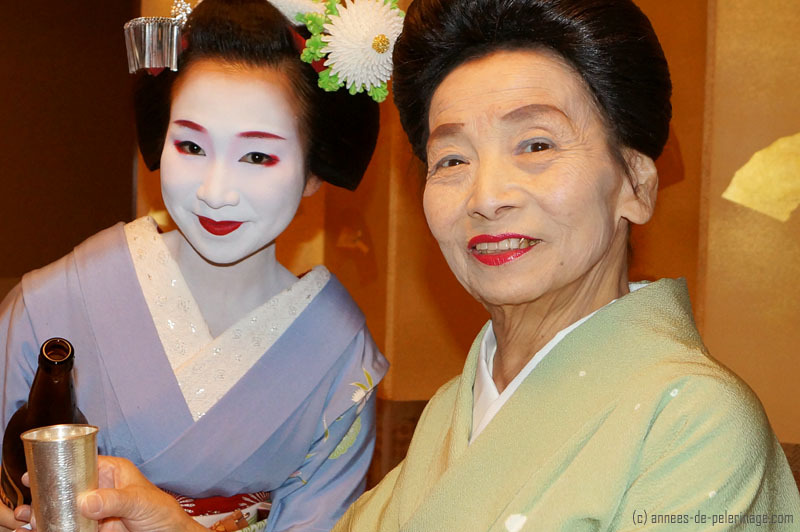 She will be accompanied by her protégé, a geisha apprentice called maiko. You can easily tell them apart. A geiko will wear a wig, while the younger maiko will have her natural hair piled into the elaborate hair-do. She will also wear the more colorful kimono and sport richer jewelry. The easiest way to tell them apart for you: If she has a flower in her hair, then it’s a maiko! 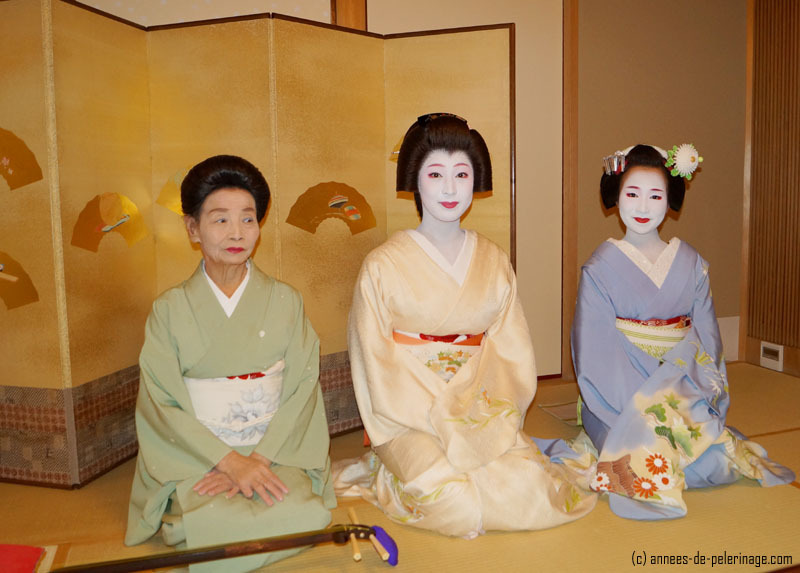 My two geishas introduce themselves as Fukumaru (ふく真莉) and Kimiaya (君綾). Those are obviously not their birth names. Geishas will take on a new name when they start their apprenticeship and change it once again when they are finished with it. A truly wonderful custom considering that some parents these days choose rather, shall we say, peculiar names for their offspring. The formal introduction, especially with new patrons, marks the official beginning of the evening. What follows is pure entertainment. This is probably an aspect few westerners truly understand. For them geishas are the doll-like prizes of their family photo album. The actual reason this profession persisted through the centuries is quite another. In a male dominated society parties sometimes get dull. Skip the sometimes and add always. Geishas on the other hand are histories first true it-girls. They go to parties almost each and every day of their life. They wear the most expensive clothes and the most exclusive jewelry. They are veritable professionals and they know how to get a party going. Now mind you, this is not your average coyote ugly party – they do it with style and they do it with class!!! An evening with a geisha is no solemn affair! It is probably the best entertainment you can get on this planet. So make use of it and carpe noctem! For me and my dad the allocated time is indeed to short. We joke, we laugh, we dance and even play some shamisen. I’m very hesitant to share a picture of my dad at this point, so I blurred out his facial outlines. The picture below might, however, give you the best impression of a geisha party. My dad, not speaking Japanese at all (unlike me), at one point tried to explain that our next stop on the road would be Beijing where we wanted to see panda bears. Not knowing how to express panda bear he simply snapped up one of the bamboo leaves from the dinner decoration and acted like he was about to eat said bamboo leave. The geiko initially didn’t understand, so my dad jokingly asked if geishas too eat bamboo leaves. The result, as you can see, was the Japanese version of the famous single spaghetti moment between Lady and the Tramp. Now don’t get the impression that this ended in a kiss. That would send the totally wrong signal. But it certainly was flirtation! A good geisha will keep you constantly on the edge, never drifting into the obscene, but also keeping you supremely entertained. Much to my dismay the geiko kindly informs me shortly after that our time with them was about to end. What followed is an exchange of business cards and a kind remember to book them again on our next trip to Kyoto (oh they surely know how to keep the dollar rolling, make no mistake!). And then, without much fanfare, they bid their fare well with elegant perfection perforating their synchronous bows. 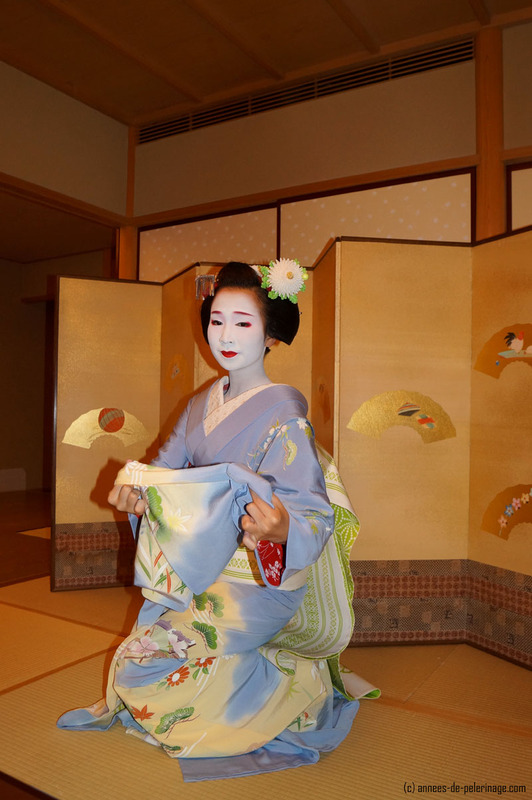 A faint whisper of rubbing silks, a muted shuffling over the soft tatami mats and then the closing of the sliding doors – that’s how my geisha experience ends. The air feels somewhat stale and the room suddenly dull and lifeless, yet the feeling lingers on. I barely notice how a maid comes in to clean away the dishes and the now cold flasks of sake. Amongst the merry splendor of the night I totally forgot that we had a lavish dinner. A bite or two pressed in between conversations, not even looking at the plate while the eyes drank in each detail of Kyoto’s silken flowers. “What fish”, my dad kindly asks “did we have during that last course?”. Fugu* she says with downcast eyes and leaves the room bowing. I hope you enjoyed my story about our Ozashiki/geisha party. Did you ever meet a geisha? Share you experiences with me! 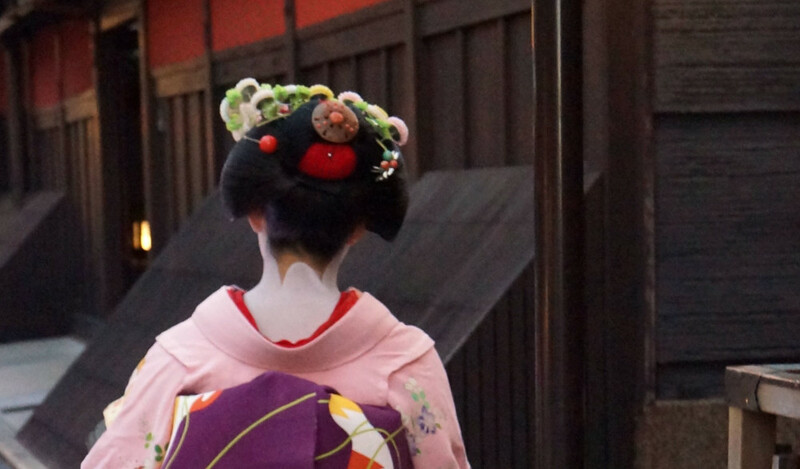 Also, read my guide on how to see geisha in Kyoto to increase your chances of getting in contact with the geisha culture! Great post! I didn’t really understand what it was all about, so this was really interesting! Do you know if they do it forever? Or do they leave and have babies sometimes? Well interesting question. Geishas are forbidden to marry; and given the strictures of Japan’s society so is having baby. That being said – many geishas retire. Some even before their erikae (that’s how you would call the official ceremony when they finish their apprentinceship and become full-fledged geishas (geiko)). I guess in the long run looking pretty and going to parties ever single day becomes tiresome for a lot. Especially since these days there are so many alternatives, while in ages past you became a geisha, and could either hope to find a guy to marry or stay a geisha. Really cool post. I feel more culturally aware now and your pictures are awesome. So sweet to see tradition alive and well among the Nippon Spirits.